I know this topic has been touched on quite a lot recently and everyone has their own opinions, but today I am here to share my own thoughts. It's been a post that I have wanted to write for quite some time now, frankly since seeing the ever so fabulous video from NikkieTutorials, which started it all but sometimes putting words into sentences that actually make sense to someone else can be easier said than done. However I'm not putting it off any longer and I do hope my rambles make sense to you regardless. Negativity on social media is nothing new, but I feel like in recent months (particularly since the new year) it has been worse than ever. I am constantly catching some sort of drama on Twitter between bloggers & women that should support each other but instead they choose to tear each other apart and it's awful. YouTube comments are the worse though, I don't think I will ever understand how someone can show so much hatred towards a person they have never even met. And to top it all off, most of the time do you know what it's all over... yup makeup! It baffles me how something as lighthearted and fun as makeup can turn so nasty at the best of times, and I'm sure I'm not the only one thinking that. So let me put it like this: makeup for me is a passion of mine, I love looking at it, applying it & being as creative as I want to be. For example in the photos above I went for super dark smokey eyes & glossy pink lips, to really emphasise the difference between my naked face. It's not a look I would typically go for but I had fun creating it and going all out (I even popped on a super old hoop earring which definitely reminded me of my clubbing days that are now far behind me). I was as creative as I wanted to be and just enjoyed the time I was able to spend creating the look. Did I damage someone by creating this super dark, smokey eye? Did I offend anyone? 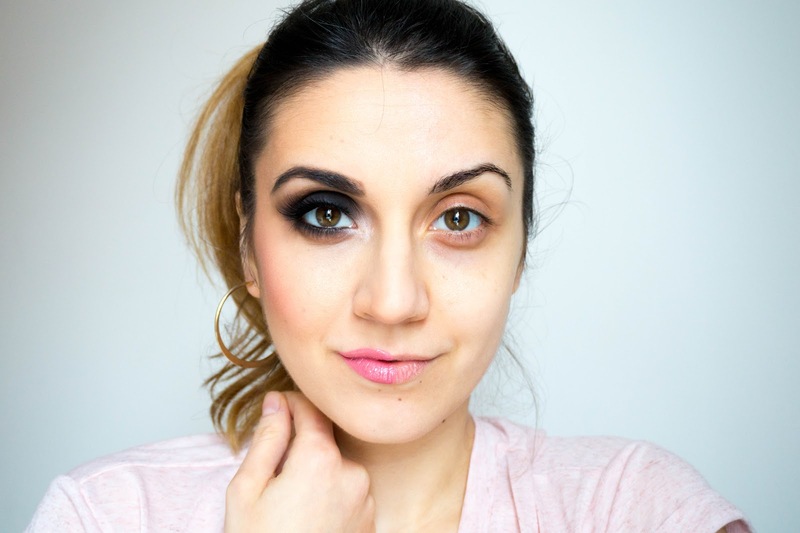 Did I try to create an illusion of someone I'm not or trick people into thinking I just naturally wake up with this super glam kind of makeup look (born with it on a whole other level right)? Nope I certainly didn't, nor would I ever try to do anything like that. I just had fun with a few of the many makeup products in my collection and overall let my creativity get loose (especially after a day of toddler fun... mommy life). Even if this is the kind of makeup look that I wanted to wear on an everyday basis, then I should be able to do so without being judged, given funny looks or comments. At the end of the day it's my face and it wouldn't affect anyone but me if I chose to go off to the park with a dark smokey eye. Somehow though I can already imagine I would get a lot of stares from other mommies who would judge me for it and that essentially is not fair. Whether a YouTuber/Blogger has a million followers or barely a few hundred, they do the exact same thing as I did. They enjoy their passion for beauty, they enjoy being creative with their makeup looks & they explore makeup trends/products. Whether they are considered beauty gurus or not, they have really human feelings, which I am sure get extremely hurt every time someone comments something nasty. So why would anyone judge someone for the way they apply their makeup?! Like do we really need to tear someone down because their eyebrows are too thick/thin, because their contour is too strong or because you can "apparently" see their highlight from outer space?! No there really isn't any need for it... don't get me wrong you are allowed to have an opinion or else the world would be the most boring place ever. But sometimes opinions are not always asked for and if you really feel the need to give it then it should be done in a way that is constructive. Now I am very lucky to have the best readers ever, which are always so positive and lovely towards me so this isn't giving out, but more like me having a rant when I see so much negativity in the blogosphere and it's over the silliest things. I spent the majority of my life worrying and over analysing every situation in my life. I was extremely shy and most of the time came across as completely rude. I had more self confidence issues than I care to admit. I struggled with abuse during my teens and eating disorders as a result. And finally I spent way too much time hiding my true self. I may be nearing towards my 30s (yikes did I really just say that) but I finally feel like I can stop hiding my personality, I can stop pretending to be someone I am not and feel happy within myself. As you can imagine it took me a long time to get to a good place like this and I will not let this crazy negativity get to me, whether it's aimed at me or someone around me. So what do I say? Feck it (bit of my Irish side for you). No matter who you are, ignore the negativity and just continue to do what you love to do. Be yourself and do what you do best, if people want to be bitter than let them waste their own energy doing that. I'd rather focus my energy into positivity that will better my life overall.